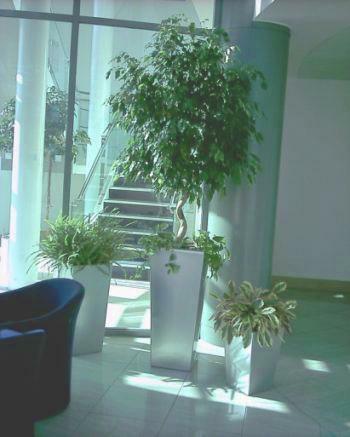 The influence of office plants on well-being, health and productivity. Considerable academic research, which shows that office plants can improve health in the workplace, has been carried out. The research has shown that plants reduce complaints of minor ailments, generally improve the feeling of well-being and also reduce stress levels. Offices in Bavaria promote plants- During a two year study in Bavaria, Engelbert Kötter working on behalf of the Bavarian State Ministry of Nourishment, Agriculture and Forestry, found that plants in offices improved employees' perceptions of their well-being as well as improving the comfort-factor of the offices. 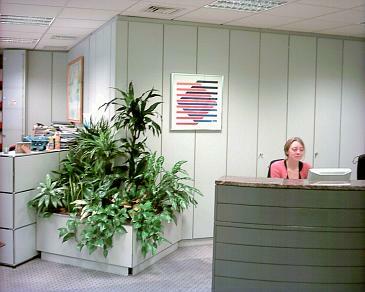 Taking 94 offices and 139 office employees, Kötter introduced plants into the offices and measured humidity and light levels which are important for plants and people; he also assessed the workers' perceptions of change to the climate of the rooms and to their own well-being by means of a series of questionnaires. Kötter also addressed the issues of noise reduction by plants and dispelled fears that plants introduced dust and germs to the environment. Central heating or air conditioning can dry the air, which can cause respiratory and skin irritation. The optimum humidity level for comfort is about 60%. Kötter found that common houseplants such as Dracaenas, Schefflera (Umbrella tree), Epipremum (Devil's Ivy) and Ficus pumila raised the humidity levels by 2 - 5% making the office atmosphere more comfortable for inhabitants. Office employees also recorded that the offices with plants felt fresher, made them feel less stressed, made the working feel more human and in general seemed to up-grade their environment. With improved conditions and perceptions, office employees will enjoy their work situation better; happy employees eqate to more output and happy bosses! In America, Prof Virginia Lohr found that plants had beneficial effects. For her study with two groups of computer operators, she monitored their pulse rates, their blood pressure and skin conductivity, where increases in these measurements show the physiological signs of increased stress. Her findings showed that the pulse rates, blood pressure and skin conductivity of the operators working in the computer lab with plants, all returned to normal more quickly. Not only that, but their concentration was better enabling them to make corrections more quickly and proving them to be 12% more productive. One would imagine that anything that reduces stress would be of interest to employers. The Confederation of British Industry published figures (1999) that showed that 1 in 5 of us will take time off work because of stress. In 1999 this meant that the British Industry lost 6.7 million working days due to stress or stress related illnesses at a cost of around 7 billion to British Industry (Health & Safety Executive). In Norway, Prof Tve Fjeld of the Agricultural University in Oslo has carried out several studies regarding the discomfort of workers. Her findings have been consistent: plants reduce minor ailments often linked to Sick Building Syndrome. Her first study was at the Statoil Offices in Oslo, where in a 2-year study using questionnaires with 2 groups of workers, she found that complaints of minor ailments decreased once plants were introduced into the offices. In the x-ray department, not only were complaints of ailments reduced, but the mid-afternoon tiredness, common in many workplaces, ceased. On average, absence from work dropped from 15.85% to 5.55%. Last but not least, the smell of the chemicals used in the process of x-raying was reduced once the plants were introduced. All in all the plants made the x-ray department a healthier place for those working there. Research results are positive - plants do improve health in workplaces. For employers, investment in interior landscaping to make workplaces healthier places is a small outlay for the savings in costs, which result from reduced absence from work and improvements in productivity.